It started with a couple of shots that were sent to my WhatsApp account on my mobile phone on 10 Jun 2015. 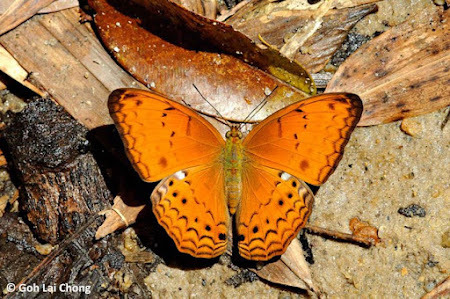 The photos were from Zhou Boyi, a Manager at the National Biodiversity Centre Div of NParks, who wanted to know if he had shot the recently discovered Malay Yeoman (Cirrochroa emalea emalea). 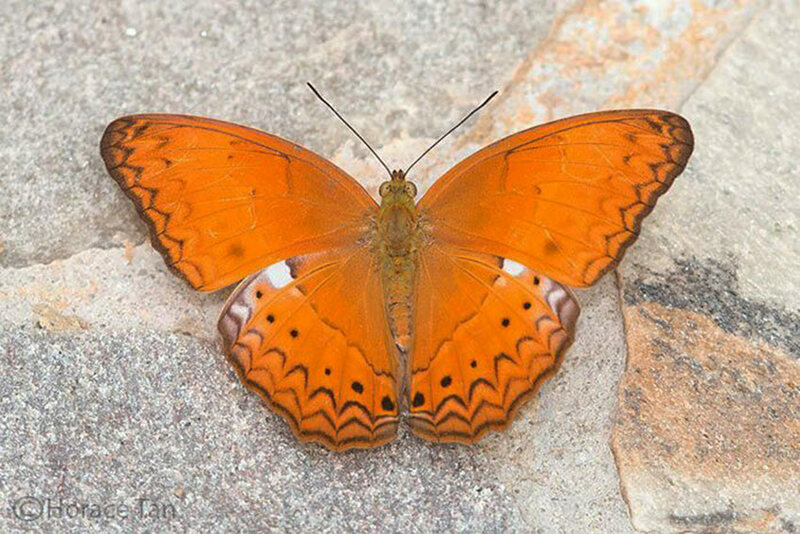 Boyi was recording shots of butterflies on the new smartphone app known as SGBioAtlas developed by NParks. However, the butterfly that he encountered did not exactly match those photos of the Malay Yeoman on the SGBioAtlas, and he was curious if he got the ID of the butterfly correct. 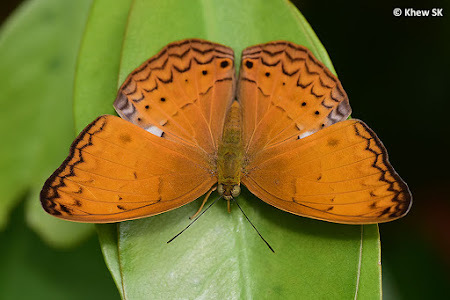 A quick look at his shots on my mobile phone indicated that what Boyi shot was indeed not the Malay Yeoman, but another close relative in the same genus Cirrochroa. 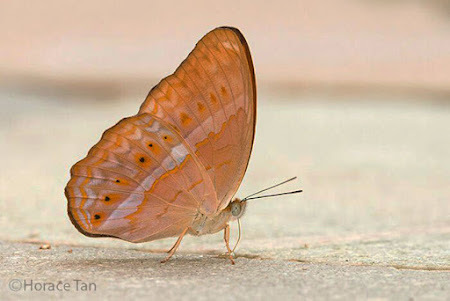 This was the Common Yeoman (Cirrochroa tyche rotundata), a species that has not been recorded in Singapore before by the early authors. 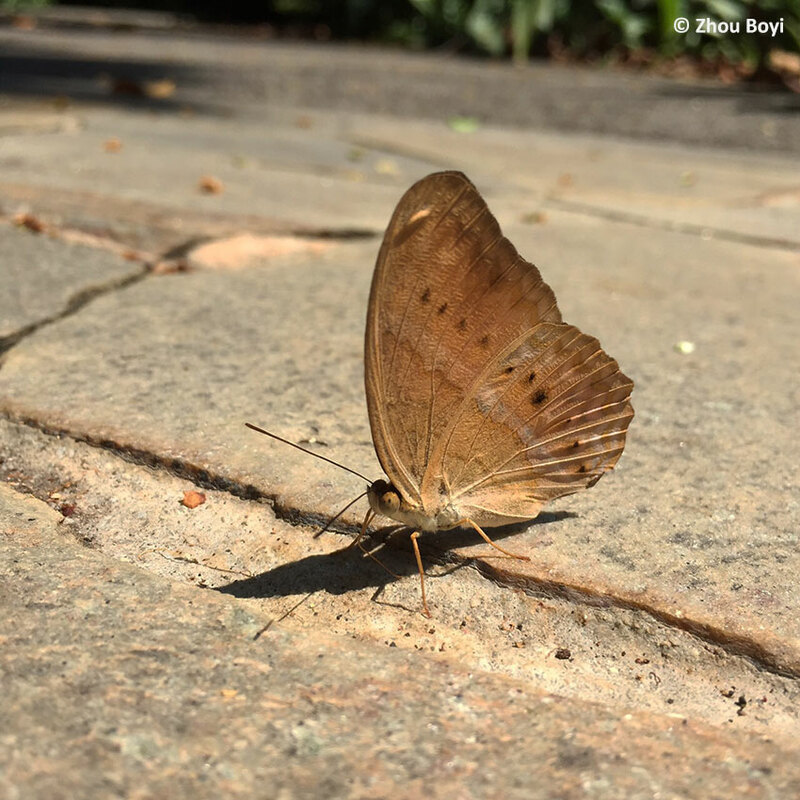 After establishing the last-seen location where Boyi shot the butterfly, ButterflyCircle members went to the urban garden to check out if the species was still around so that we could take more shots of this new discovery. 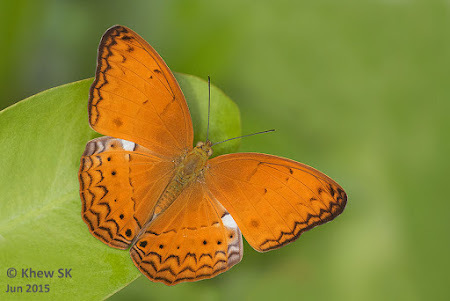 Coincidentally, ButterflyCircle members also discovered another orange-coloured species, the Vagrant (Vagrans sinha sinha) in 2013, at another urban gardens in Singapore. To our surprise, we discovered a small colony of the Common Yeoman! 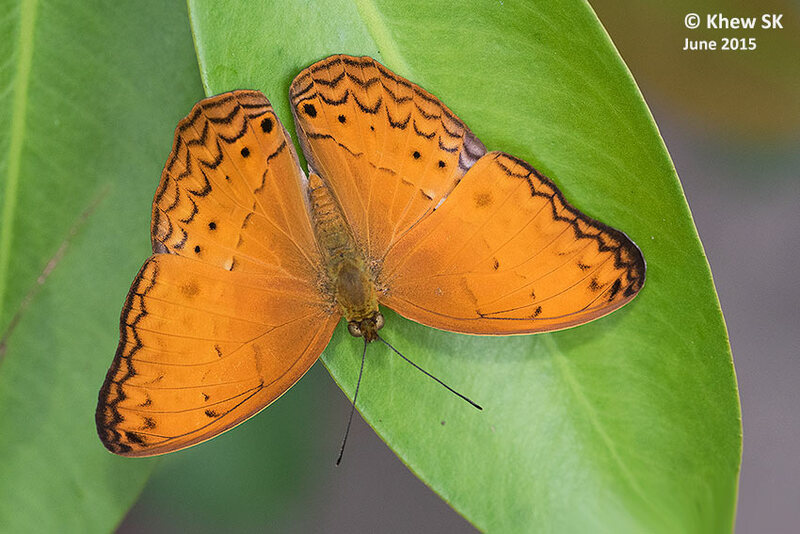 Earlier records of new discoveries and re-discoveries in Singapore, where individuals were reliably photographed, were either seasonal or migratory individuals chanced upon by butterfly enthusiasts. For these species, only one or two sightings were made, and many were not seen again. 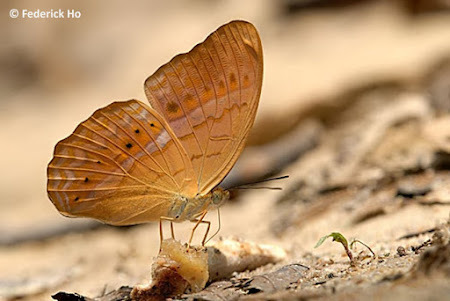 However, the presence of the colony of the Common Yeoman suggests that this species could have been successfully breeding in Singapore for some time already, before it was spotted. At the location where it was first discovered by Boyi, we spotted at least half a dozen individuals and even a female ovipositing on its host plant. 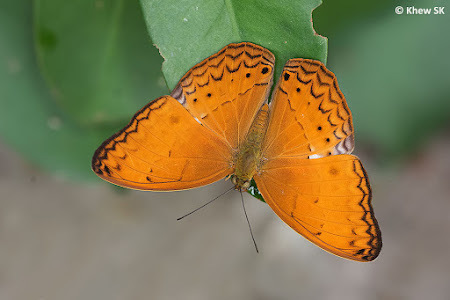 It is an active butterfly, flying restlessly and rarely stopping to rest, reminiscent of the common Leopard (Phalanta phalantha phalantha) - flapping and turning with half-opened wings even when at rest. 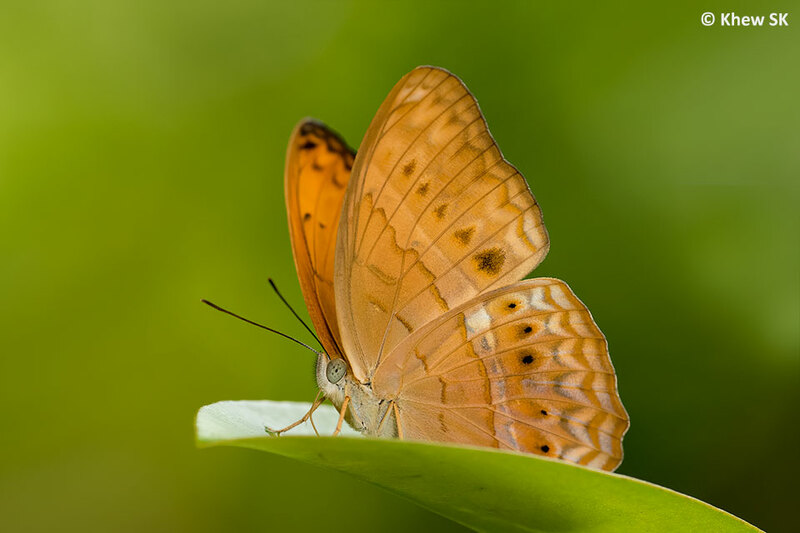 When actively fluttering around, it can tire even the most determined of photographers with its unceasing skittish flying behaviour! After some time of patient waiting, we spotted a puddling male Common Yeoman that was cooperative enough for us to photograph it. 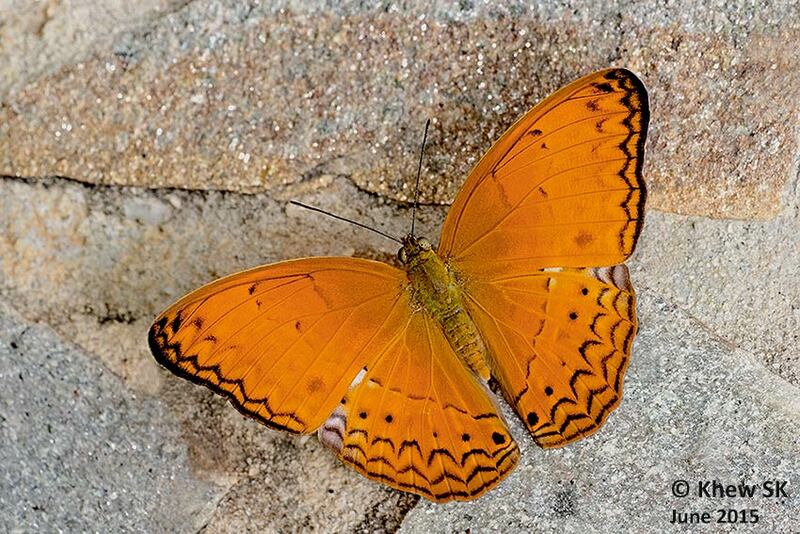 It appeared to be a recently-eclosed individual, from its bright colours and pristine wings. In the meantime, several other females and males were spotted fluttering around the shrubbery, making only momentary stops to rest. 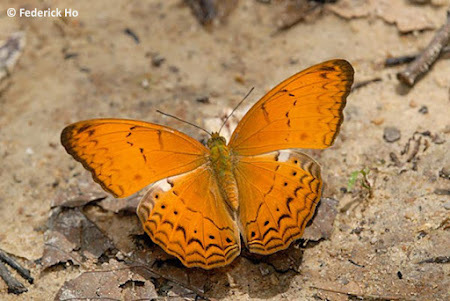 The Common Yeoman can be found in West Malaysia, and we have photographed it at the Panti Forest Reserve in southeast Johor, a mere 40-50 km drive from Singapore. There, it demonstrated the same active and skittish behaviour and was also photographed puddling on damp footpaths in forested area. A quick comparison of the photographs of the Common Yeoman shot in Singapore showed that it matched quite closely with those shot in West Malaysia, in particular those from Panti Forest. 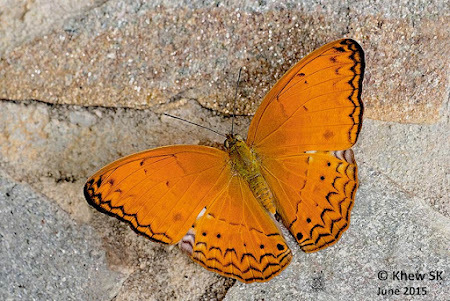 This would be the Malaysian subspecies rotundata. 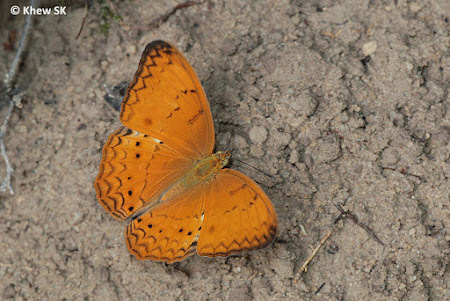 The Common Yeoman is fulvous orange above, with a black distal margin or with black sinuate marginal and submarginal spots and lines. 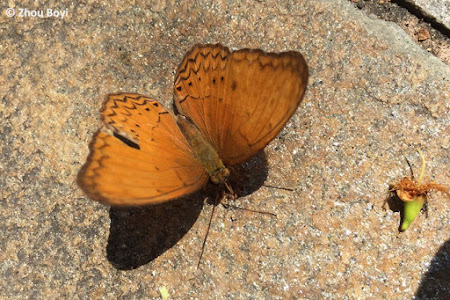 The Common Yeoman does not have the broad black apical area on the forewing like the other related species. The underside is paler with a silvery white or whitish transverse band across both wings. 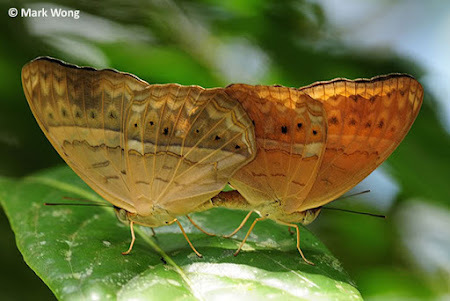 In the Common Yeoman, this pale discal band is narrow and generally uniform in width across both wings, whilst the band widens towards the costa of the forewing in the other related species. How did the Common Yeoman appear in Singapore? Did it migrate naturally across the Straits of Johor, when the prevailing winds were in its favour? Or did the caterpillars or pupae of this species stow away on plants that came into Singapore? Many theories may be expounded as to how this species first came to Singapore, but we will never know for certain. A Common Yeoman perched on a leaf. Shot in Singapore. That a colony of the butterflies has now established themselves in Singapore is now certain. For how long this will sustain, we will have to observe closely. Would the lack of genetic diversity wipe out the species after a few generations due to inbreeding? Or will it thrive and be a resident species in Singapore and adding to the biodiversity of our butterfly fauna? Its geographical range is described as "occurring throughout Sundaland", but why was it not earlier recorded in Singapore? As with many mysterious phenomena occurring in our natural world, there are more questions than there are answers. But we will record the Common Yeoman as species #318 in the Singapore Butterfly Checklist, and observe whether the species will continue to flourish on our little island in the sun. Special thanks and credit to Zhou Boyi of the National Parks Board for the discovery of this new butterfly species to Singapore.